People who enjoy wine tasting and vineyard tours might be surprised to learn that in Arizona we have a flourishing wine industry. In the Verde Valley region of the state has ample sunshine and soil that is conducive to growing vines that produce high quality grapes. Within a few hours of the Phoenix area you can visit more than ten Arizona tasting rooms that feature wines cultivated from Arizona orchards. Harvest season is August through October. During that time, tours are usually suspended. 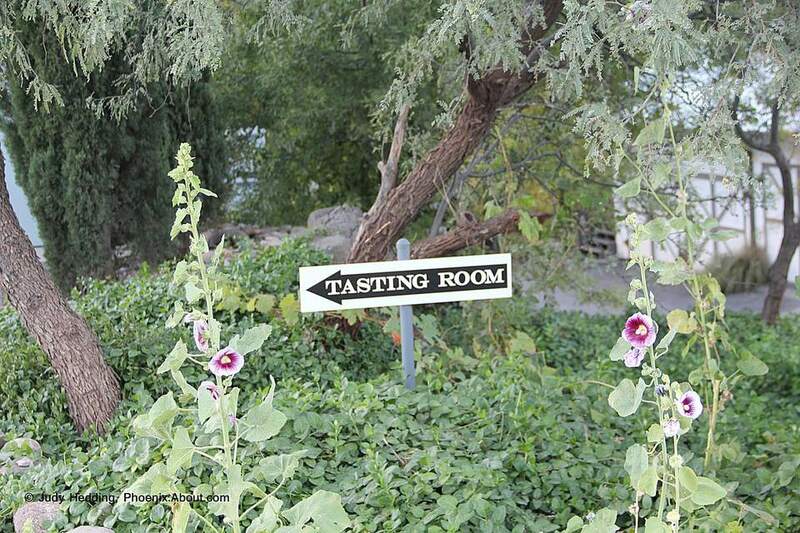 I took a weekend to explore some of our most popular wine tasting rooms north of Phoenix. You can take a day trip or spend several days, but a drive up for the afternoon and evening in the Cottonwood area was the focus of this trip for me. I spent the night in Cornville at the Highlands Resort, which is right near Cottonwood. On a subsequent trip, on my way to Antelope Canyon, I did ventured into Jerome for a few more wine tasting stops. You can certainly do all of these in one weekend, or even one day if you are intense about your wine tasting! Jerome doesn't have many hotel choices or any hotel chains, so if you aren't interested in historic properties or B&Bs, I recommend staying in Cottonwood. It's less than half an hour away from Jerome. On the following five pages you'll see which wine tasting rooms I visited. Please be aware that only people who are over 21 years of age should participate in wine tastings in Arizona, and your group should have a designated driver or hire a tour guide who will not be tasting wines. This map from the Arizona Wine Growers Association is a handy item to take with you on your wine tasting adventure. The Oak Creek Vineyard and Winery produces several whites, reds and dessert wines. In addition to wine tasting, they conduct periodic vineyard tours. Snack items such as cheese, meats and chocolates are available in case you'd like to picnic at the outdoor tables. Quotable: "The volcanically enriched soil of the dessert also enhances the stock to create a one-of-a-kind flavor unique only to this region..."
Visit Oak Creek Vineyards online. Javelina Leap is family owned and operated. You can tour the winery and the barrel room -- the cellar has a 100 barrel capacity. In the vineyards they have planted Zinfandel Cabernet Franc and Petite Verdot vines. Other varieties are planted on property outside of Cornville, and some grapes are contracted from Southern Arizona vineyards. Quotable: "Arizona, California, Spain, Portugal, Italy and Bordeaux France are all between 34 and 45 degrees latitude north of the Equator placing Arizona among some of the most famous wine destinations in the world." Visit Javelina Leap Vineyard online. Page Springs Cellars is a family owned vineyard. They specialize in Syrah, Petite Sirah, Grenache and Mourvedre. Weekly tours are offered, during which you can visit the vineyard, wine cellar and the barrel room. Children may attend the tour. Instead of dining at a traditional restaurant on the evening we visited the area, we chose to sit outside at Page Springs cellars, overlooking the vineyard at sunset and sharing a lovely plate of cheeses, fruit, meats and nuts, pictured above. Naturally, we ordered the Arizona Flight. Quotable: "We feel strongly that growing grapes, making wine and raising a glass is a cultural ritual that fosters friendship, brings together families, and unites communities. Good wine is not strictly the esoteric fare of nobility: Wine is for the people." Notable: Page Springs Cellars has announced a plan to install more than 375 solar panels at their vineyard and winery in northern Arizona. The solar panels will generate more than 85 percent of the winery’s needed energy. The project establishes Page Springs as the first winery in Arizona to implement solar technology. Visit Page Springs Cellars online. Pillsbury Wine Company grows Syrah, Mourvedre, Grenache, Petite Sirah, Viognier, Malvasia, Chardonnay, Pinot Grigio, Symphony, Rousanne and Chenin Blanc. Owner Sam Pillsbury has received numerous awards and accolades for his Arizona wines. The tasting room in Old Town Cottonwood is open seven days per week. More than 50 restaurants in Arizona have Pillsbury wine on the menu, and you can buy it at many local retailers. Quotable: "Growing up in NZ Sam witnessed the phenomenon of growing classical wine grapes in unusual places. On a camping trip in Arizona thought he could try the same thing here." Visit Pillsbury Wine Company online. Arizona Stronghold has a tasting room in quaint, downtown Cottonwood. It is a comfortable place, designed more like your living room than a bar, where you can lounge and taste, listen to music on Friday nights, use the free WiFi. They are open seven days per week. Stronghold Wines (as opposed to Arizona Stronghold Wines) are not created exclusively from Arizona grapes. Fruit for those wines are sourced from various regions. Quotable: "Arizona Stronghold Vineyards was formed to put Arizona on the fine wine map. While small bastions of artistry have made a few waves with wine aficionados, Arizona still remains a vinous backwater in the minds of the wine world....The potential to make great wine has always existed in the Southwest, yet the talent and willingness to invest here had yet to fully blossom until recently." On a short turnaround trip you might not get outside of the Cornville/Page Springs/Cottonwood area, but if you have more time to spend and your goal is more wine tasting, there are certainly additional opportunities for that close by. I did not get to the wine tasting rooms listed below, but I will on my next trip! I will remember our wine tasting trip to the Verde Valley area for many years to come. The friendly people, the natural beauty of the area and the cool higher elevations -- I will have my souvenir glasses to remind me. There may be an extra charge for the souvenir glass at your wine tasting. I am a wine lover, so wine glasses make reasonably priced souvenirs for me. They might also make a nice gift for a wine loving friend! Next page >> What Else is There To Do? If you have more than a day or two to spend on your wine tasting adventure to Central/Northern Arizona there are several wonderful options for activities that the entire family can enjoy. Since you can't go out wine tasting in the morning (the wineries aren't open that early), how about some fresh air? Take a little hike and see the fish at the hatchery. There are no reservations needed and there is no fee to walk around and visit the hatchery. It's a very popular place for bird watching, too. If you love trains and lovely scenery, this trip is for you. It's two hours each way, and you stay on the train the whole time. It leaves from and returns to Clarkdale. Out of Africa Wildlife Park is located on more than 100 wilderness acres in Camp Verde, Arizona. Lions and tigers and zebras, oh my! For a bit of local history and some amazing cliff dwellings, a visit to these two National Monuments is not far from Cottonwood. Both Montezuma Castle and Tuzigoot are managed by the National Park Service, and there is fee for entry. You can find them both on this map of National Parks in Arizona, right in the middle of the state. If you are visiting from out of town, and you might not get back to this area for a while, a trip to Sedona is a must-do. Sedona's red rock country is amazing, and if you only have a few hours to spend there, I highly recommend taking a jeep tour. Sedona is very close to the Cottonwood and Page Springs wineries. I admit it. On the way home from my wine tasting weekend, I stopped to do a little shopping. The perfect end to a wonderful trip!